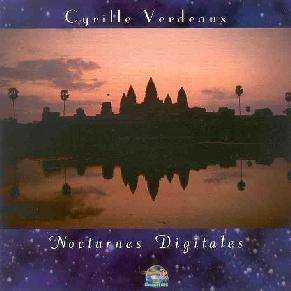 Cyrille, Verdeaux - "Nocturnes Digitales"
Cyrille Verdeaux is a French born musician who composes very mellow flowing pieces of what some people would call New Age music. He formed the band Clearlight many moons ago and they were the first French Progressive Rock band to sign to a major English Label. That was in 1975 and the label was Virgin. A debut album entitled Clearlight Symphony was soon released the same year and a second album Forever Blowing Bubbles was released in 1976. Many more albums were to follow and the list goes on, so Cyrille has been about and has learnt his trade well. He creates very atmospheric structures that are laden with mellow vibes. His sound and composition style is similar to Mike Oldfield, but Cyrille Verdeaux I would say has a more electronic feel to his compositions than Mike Oldfield has, very haunting. There is an array of nice well-played keyboards on here. They are constructed with an almost classical style to them, and there is an air about them that stirs Ennio Morricone sort of emotions. It is a very good relaxation album. For did you know that this album was created to reharmonize your biorhythms and resynchronise the patterns of DNA? So you have been warned! Also this CD is a CD-ROM so it has some Bio stuff and links to websites, etc. So it is a nice little package. I do not know if this is the same Nocturne Digitales that was released on an American label in 1980 or a different thing all together for I really do not know much about it. I can say that it creates a very enchanting feel and it motions through a lot of different phases. I personally like the first installment 'Wind Talks' which is the longest track on the CD at 10.08. It builds like an Ennio Morricone composition and has hints of a similar musical structure movement-wise. I like it. Nocturne Digitales is a 66.28 journey, which is a very relaxing ride. It is made up of 9 tracks of varied lengths, and most have that sublime feel to them. The Keyboard work is stunning and the sound quality is produced to a very high standard. The cover is inspired by New Age stuff and it has a nice photograph and write-up of the Ankor Wat Temple in Cambodia, as well as the DNA patter. In all this is a mood creating CD by a very talented musician. Cyrille is dedicated to his work and has over twenty years experience in the ways of sound experimentation. So get hold of some of his stuff and decide for yourselves what you think. For more information you can visit the Clearlight Music web site at: http://www.clearlight888music.com. Contact via snail mail c/o Clearlight888 Music; 2022 Cliff Dr; PMB 189; Santa Barbara, CA 93109.